In Oboe Art and Method, veteran oboe performer and instructor Martin Schuring describes in detail all of the basic techniques of oboe playing (including breathing, embouchure, finger technique, articulation, and phrasing) and reed making, with expert tips and step-by-step instruc... read full description below. Oboe Art and Method is a complete and comprehensive guide to oboe technique. 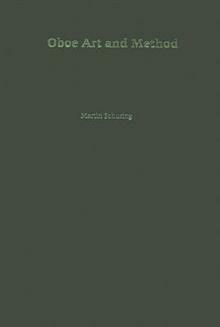 Author Martin Schuring, a veteran oboe performer and instructor, describes in detail all of the basic techniques of playing (breathing, embouchure, finger technique, articulation) and reed making, with expert tips and step-by-step instructions for how best to perform each of these tasks with grace and technical efficiency. 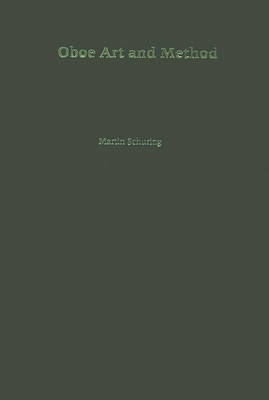 Schuring's descriptions are straightforward and articulate, designed to encourage students to focus on the basic techniques of tone production as a springboard for more nuanced artistic development. Key sections address long-tone and scale practice in ways that go beyond advice most teachers will give their pupils, and the author's focus on embouchure development cultivates supported breathing and blowing to help provide the best foundation for aspiring oboists. In addition, he offers chapters on the practicing, instrument care and adjustment, professional development, and career development issues, all designed to help students practice meaningfully and with purpose and guide them throughout their careers with the oboe. A reliable source of practical and time-tested advice, Oboe Art and Technique will appeal to all who teach or are learning to play the oboe, whether at conservatories or in private instruction. A coherent overview of the fundamentals of technique, it will also be a terrific brush-up guide for professionals and amateur enthusiasts alike. Martin Schuring held orchestral positions with the Hong Kong Philharmonic, The Florida Orchestra, and the Phoenix Symphony before joining the faculty of Arizona State University in 1992, where he is now Professor of Music. He has played in the Grand Teton Music Festival Orchestra since 1980.